Swami Tattvarupananda Saraswati was born & raised in Kerala’s culture capital, Trichur, India. As a spiritual seeker from a young age, he was fortunate to have met many different masters of repute. At the age of 18 he joined the Narayana ashrama, Tapovanam, in Trichur, and studied under the guidance of Swami Bhoomananda Thirtha, which later facilitated his Vedantic studies. Keen to live his life as a Yogi, Swamiji set off for the Himalayas in search of a master & underwent rigorous spiritual practices in the company of many Himalayan spiritual masters. During this time, meeting with Sri Swami Dayananda Saraswati, the well known traditional teacher of Vedanta, was the most important event in Swamiji’s life. After studying the Prasthanatraya viz. Upanishads, Bhagavad Gita and Brahmasutras with Adi Sankaracharya’s Commentary, Swamiji mastered the scriptures & the traditional methodology of teaching from Swami Dayananda Saraswati. Swami Dayananda Saraswati initiated Swami Tattvarupananda Saraswati into the traditional order of the Sanyasa in 2003. From 2004 onwards, Swamiji has taught Bhagavad Gita classes during Teacher Training Courses and Raja Yoga Sutras & Sanskrit during Advanced Training Courses to students in Sivananda ashrams in India. 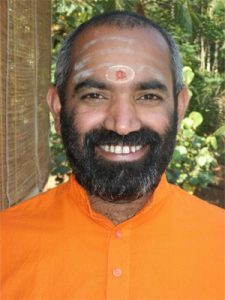 When Swami Dayananda Saraswati started AIM For Seva ( All India Movement For Seva ) in 2000, with the advice of Pujya Swamiji, Swami Tattvarupananda Saraswati opened in 2003 the Trivandrum Chapter of AIM For Seva. In 2005 Smt. Vasanti Jayaswal from USA, a devotee of Pujya Swamiji, donated her land and building to AIM For Seva, the Janaka Janani Kripa Gurukulam Complex. Pujya Swamiji entrusted Swami Tattvarupananda to take care of this place and run a student home. On the 16th of April 2006 Swami Dayananda Saraswati inaugurated the Janaka Janani Kripa Gurukulam in the presence of Travancore Maharaja Uthradom Thirunal Marthanda Varma. Since then Swami Tattvarupananda Saraswati is taking care of this place. Here children of dysfunctional or under- privileged families are provided with shelter, food & clothing and are given traditional & academic education, giving them the opportunity to grow into responsible human beings. Swamiji teaches Sanskrit, Bhagavad Gita, Upanishad and other Vedantic text related to Yoga. Swamiji is a master storyteller. He has a simple, humorous and direct way of teaching, which is much acclaimed all over the world. Nobody can miss the truth when it is unfolded traditionally and teachers from traditional lineages are rare. Swamiji is currently engaged in teaching scriptures at different locations for Sivananda Yoga Vidya Peetham in India, Centres of Haus Yoga Vidya in Germany and for different spiritual groups in France, Denmark, the Czech Republic, Portugal, Japan and also Thailand and Russia.